Several years ago our we decided to adopt a dog and it seemed like the right thing to do to adopt from a rescue organization. We visited many dogs and eventually found our match at the Vancouver Animal Shelter. Jessie was a lovely lab-x who had a rough beginning in life and had ended up as a stray. Apparently large black dogs are some of the last to get adopted so Jessie had spent many months in two different shelters looking for an adoptive family. When we took him home we truly believed that just love and affection would make Jessie a fantastic family pet. Although while we were at home Jessie was a fabulous dog, all bets were off when we left the house. Jessie suffered from terrible separation anxiety and we arrived home on many occasions to major destruction in our house. Jessie was too difficult to leave in a crate but on his own was ripping up furniture and was howling and barking non-stop. Even with medication and treat-training, his condition only improved slightly. We were becoming prisoners of our dogs behaviour and could not leave him alone for more than two hours at a time. After arriving home to find our new wooden blinds smashed to pieces, we knew this couldn’t go on. We were becoming prisoners of our dogs behaviour and could not leave him alone for more than two hours at a time. We called Sit Happens and met with Jeff who amazed us with his demonstration, and the change in our dog’s behaviour in mere minutes. Jessie was progressing wonderfully with Sit Happens but unfortunately died in a terrible accident only weeks into his training. We were devastated. After a year without a dog, we once again decided to adopt. This time we decided to get a puppy believing that this would provide us with a “fresh slate”. 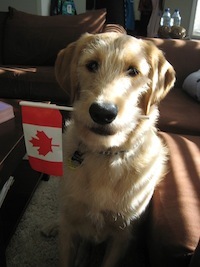 We thought that we would be able to easily train a puppy and so adopted Charlie, a labradoodle, golden retriever cross. After the cute and fuzzy puppy stage, we ended up with a 85 pound unruly dog that had the run of our house and neighbourhood. Several chewed socks and frustrated outings later, we once again called on the services of Sit Happens. After the cute and fuzzy puppy stage, we ended up with a 85 pound unruly dog that had the run of our house and neighbourhood. Jeff came to see us in our home and provided us with some immediate strategies to help get Charlie into line. 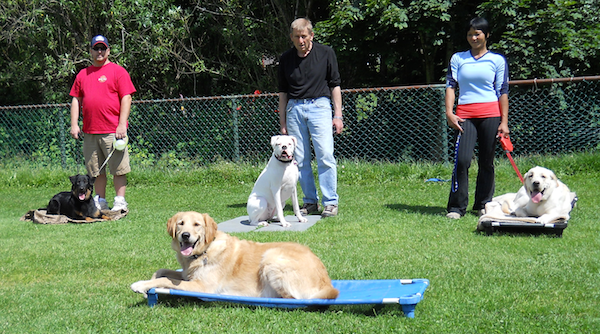 Because Sit Happens has unlimited training, we also took advantage of weekly classes in the community. Charlie’s training has come a long way and the difference is remarkable. Although Charlie will always be “chronically friendly”, at 18 months he is becoming that lovely family dog that we have always wanted. We would highly recommend Sit Happens to new dog owners, those with difficult dogs, or anyone who just wants a well-behaved family pet.